London Mayor Boris Johnson has clashed with his predecessor Ken Livingstone over the funding of the 2012 Olympics. Mr Johnson told BBC Radio 4 a deal signed by Mr Livingstone on cost over-runs was "far from clear" and he doubted its existence. Mr Livingstone said the comments were "bizarre" as the memorandum of understanding had been published. He said it guaranteed Londoners would not pay if the Games went over budget. Mr Johnson has made a similar pledge. In his Today interview, Mr Johnson acknowledged there were "concerns" about over-runs on "big ticket items" but said that did not mean the project as a whole would go still further over budget. Mr Livingstone said last year he had signed a memorandum of understanding with the government to cover what would happen if there were any cost over-runs. 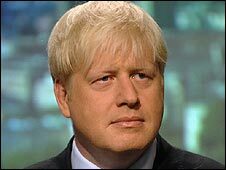 Asked if he would publish the document, Mr Johnson said: "I rather doubt that it exists. "There is a doubt the agreement that was struck between the former mayor and the Labour prime minister about the exact extent of London's obligations." Pressed on the terms of the agreement, Mr Johnson said: "There is a dispute at the moment between the GLA and the mayoralty and the government about who is up for the over-runs in so far as they may or may not occur. "The details of this deal are from clear." He added: "What I want to do is to make sure there are no over-runs." And he promised that "these are going to be the most wonderful Olympics in history, since 753BC or whenever it was that they kicked off". Mr Livingstone and the Department for Culture, Media and Sport both contacted the Today programme after the interview with Mr Johnson had been broadcast to confirm the existence of the memorandum - and the fact that it had already been published. Mr Livingstone said: "I find this bizarre. It was published in the House of Commons Library, Boris could have seen it as an MP, I gave a copy to every member of the London Assembly." He said it was a "very good deal because it specifies in writing, with the government's signature and mine, there will be no increase in the council tax and no increase in fares if there are any further cost over-runs". He said the memorandum, which was on the DCMS website, mostly dealt with "who will get most out of the profits when the land is sold after the Olympic Games". In a report published on Wednesday, David Ross, the Olympic watchdog appointed by Mr Johnson, warned the credit crunch and a collapse in property prices could mean "significant" extra public money would be needed. Mr Livingstone said Mr Ross had done a "very reasonable job" in identifying areas which could go wrong. "Clearly if the property market collapsed for a decade and we had something like the 1930s, these figures all fall apart. "But I think most people assume we are going to have a couple of bad years and then both land and property prices are going to be growing again quite strongly by the time of the Olympic Games. We will get our money back." Asked why the rest of the country should pay for something that mainly benefited London, Mr Livingstone said it "rebalances the national finances" for the "30 years" when the capital had no infrastructure investment. In his report, David Ross revealed that "new economic and market conditions had put additional pressures on the venues' budget which had risen by £106m". He says the credit crunch, falling house prices, increased oil and raw material costs and the threat of terrorism were factors which will add "significant pressure" to the cost of the Olympics. Mr Ross also pointed to difficulties in securing finance for the Olympic Village and said work was ongoing with the developer, Lend Lease, and its banks to secure private equity and debt funding. He warned: "In all scenarios some significant additional public sector funding is likely to be required to deliver the project." However, he said savings made elsewhere meant there "has only been a very small increase in the overall anticipated final cost of the total programme of £16m".